This blog is for all of you DIY folks, contractors and other construction professionals, and anyone else who rents hydraulically powered equipment. A couple of weeks ago, I rented a walk-behind trencher for a weekend project. When it showed up, it was in such a state of disrepair that it made me wonder how these folks stay in business. The chain was dull, the gear selector would not stay in a position and the engine was hard to start. While all of those issues were bad enough to justify a return of the equipment on their own, it was the condition of the hydraulic hoses that truly made me cringe. The high-pressure lines were routed so poorly that the metal parts of the trencher had literally shaved off the hoses’ outer cover, exposing the metal reinforcement. I returned the equipment and took time to point out all of the damaged hoses to the clerk. When I brought up the danger of hydraulic injection injuries that could be caused by pinholes in high pressure hydraulic hoses, the gentleman was very familiar with the topic. He made a note of the issues and I assumed that the equipment would be repaired. A week later, I was driving by the same rental place again and got curious about whether the repairs had been made. The trencher was in front with other equipment available for rental. It looked like it had been gone over. The chain had new teeth – but not a single hose was replaced. Unfortunately, someone who rents the same trencher in the future could be sprayed with hot hydraulic oil during operation, or worse, injected with hydraulic oil should one of the worn-out hoses develop a pinhole leak. 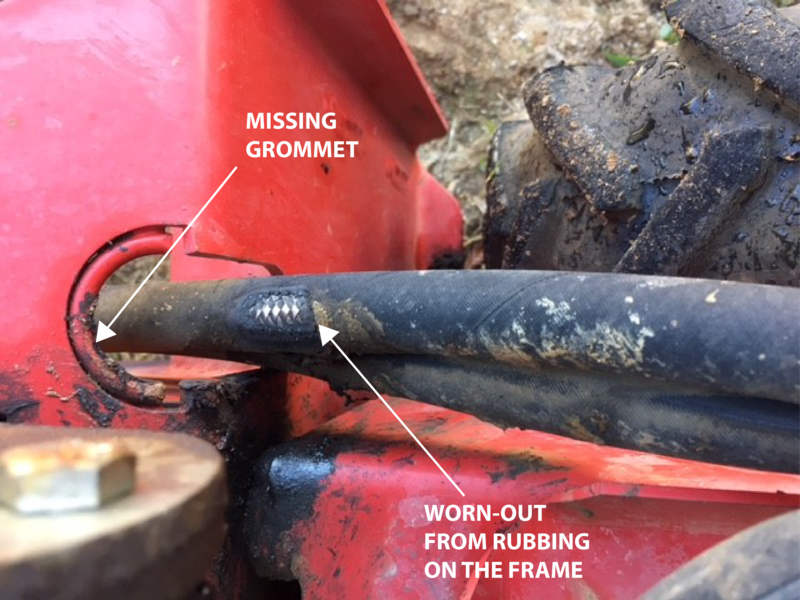 Read on to learn how to spot troublesome hydraulic hoses. 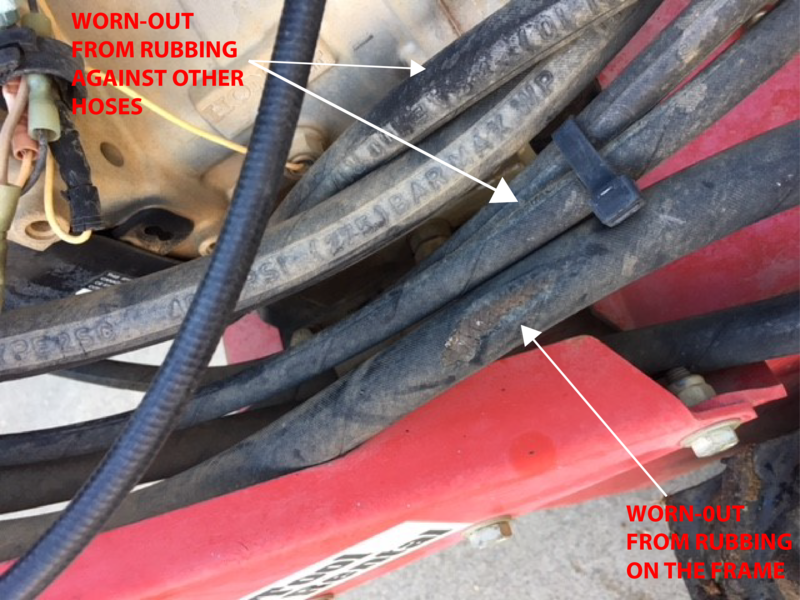 In the picture below, notice how poor routing caused all of the hoses to wear out prematurely. If you see this much wear on any hydraulic lines, do not use the equipment. The hoses should never be allowed to rub against each other or against other parts of the equipment. 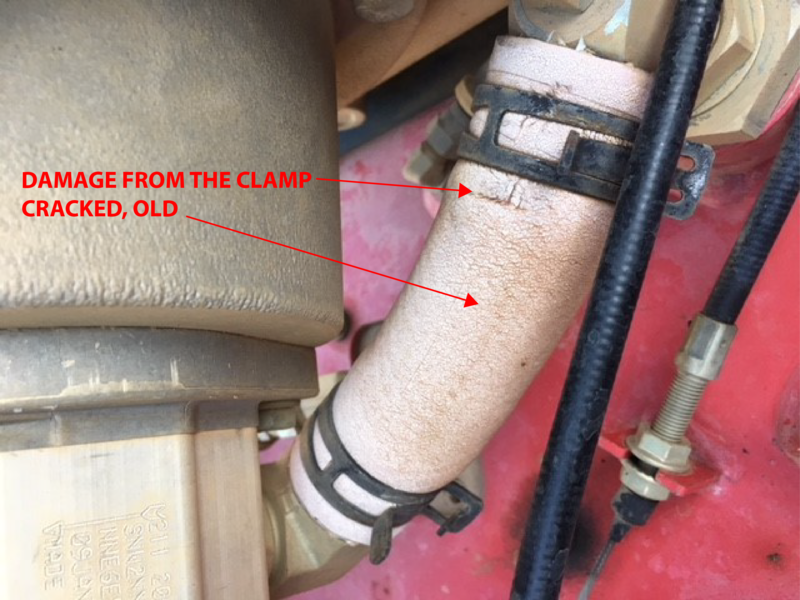 Hose clamps should be used to secure hoses in the proper position and prevent them from rubbing against each other or other parts of the equipment. In the next picture, the hose was allowed to rub against the frame. It looks like a rubber grommet is missing. The hose in the picture below is cracked from heat, exposure to UV - and probably just old age. Rubber hoses should not be used if they are older than 10 years. Also, notice the damage from the clamp. The hose should be never bent right at a fitting like the one below. Many times, mechanics use a straight fitting instead of 45 degree or 90 degree elbow. 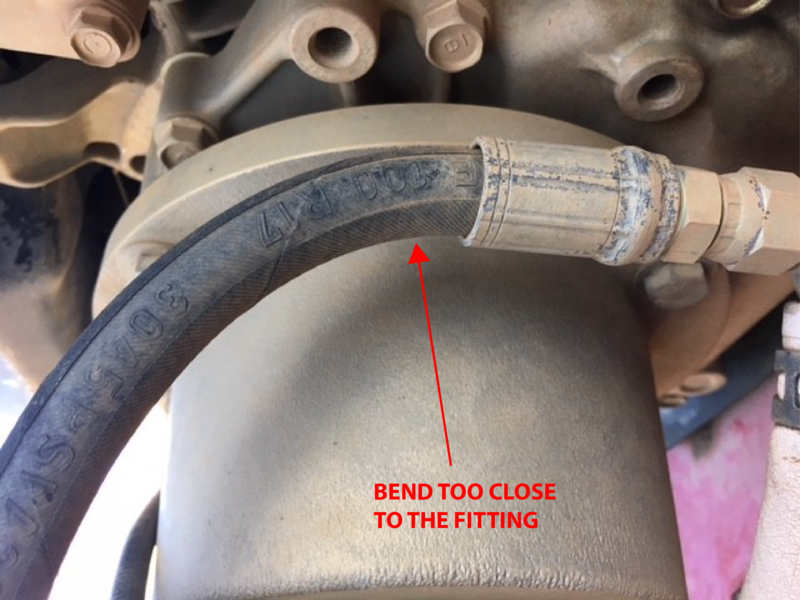 As a result, a hose is forced to bend right at the fitting. Another cause for a bend too close to the fitting is using a hose assembly that is too short. In either case, a hose can pull out of the fitting over time. If you ever see a hose that looks like any hoses in the pictures above, do yourself a favor, stay safe and do not use the equipment.